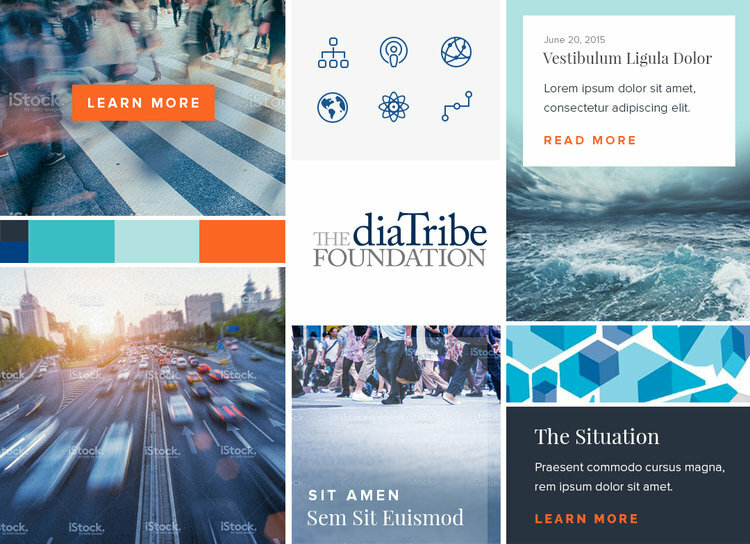 As The diaTribe Foundation (TdF) rapidly grew, they needed a website that grew with them and adapted to their changing programs. In this case study, you’ll learn how TdF used continuous improvements to not only keep their website current, but leverage it as a platform to fuel their growth. The diaTribe Foundation works to improve the lives of people with diabetes and prediabetes, and to advocate for action. TdF started working with Brooks Digital in 2012—before they even received their official 501(c)(3) status. In that time, they have transitioned from a small labor-of-love newsletter to a rapidly growing nonprofit foundation. Like most of our clients, a large percentage of their programs revolve around their Drupal website, making it a critical asset for their organization. Multiple revisions to their website, including a move from a completely static website a developer needed to update by hand, to a Drupal 6 website, to a Drupal 7 website. Improvements to their publishing and email process, including replacing hand-coded HTML emails with a MailChimp integration that allows staff members to build emails without the help of a developer. The development of an integrated fundraising platform on their Drupal site, with support for multiple campaigns, landing pages, recurring donations, and more. Each of these changes has brought a new strategic direction to their organization designed to reach more people impacted by diabetes and bring them educational resources to improve their lives. Some big wins are outlined below, but as we’ve partnered with TdF to help with these strategic changes, the impact has been staggering, to say the least. Not only has TdF eclipsed the 7-figure fundraising mark in less than four years from their 501(c)(3) inception, but awareness of their organization has increased by 16,000%. Using this strategy, TdF was able to create self-serve landing pages that grew their email list from under 20,000 subscribers to over 100,000 subscribers—in less than 24 months. In fact, just one page on their site is responsible for over 70,000 email signups over its lifetime. Early in TdF’s growth, their foundation didn’t have a dedicated web presence despite being formed over two years prior. While they had a small section on the website of their main program, the diaTribe.org diabetes education site, there was a growing concern that TdF’s lack of a dedicated website would hinder their fundraising capabilities. Would a major donor seriously consider TdF if they didn’t have a website outlining their mission and impact? We got to work helping TdF create a dedicated site for their foundation so they could hit their fundraising goals. Because it was important to create a specific emotional response for this design, we took TdF through the process of creating a mood board to make sure we understood exactly what they were trying to communicate. Using feedback from TdF we created a collage of visual elements to represent the overall mood and tone of the design. 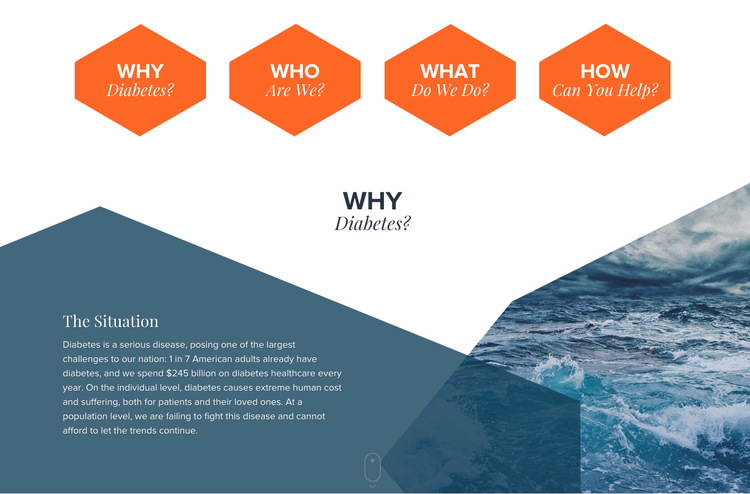 By using images of people in motion, forces of nature, and a vibrant, compelling color scheme, we were able to evoke a feelings of alarm and urgency without making diabetes feel like an unsolvable problem. It was important to TdF that their website create a unique, memorable experience for its visitors – that they were perceived as different and special so that their organization would stick in the minds of potential donors. By incorporating abstract geometric shapes into the design—starkly contrasted against the linear designs employed by many other websites—we were able to create a unique, memorable visual style for TdF. The results of this new website were incredibly positive. Not only was the site something staff was proud to share, but (most importantly) TdF was able to achieve their fundraising goals and secure the major gifts they needed to grow their organization by nearly 100% year-over-year. Let’s build your nonprofit a data-driven web presence. We help nonprofits build data-driven websites using Drupal and other open source software.